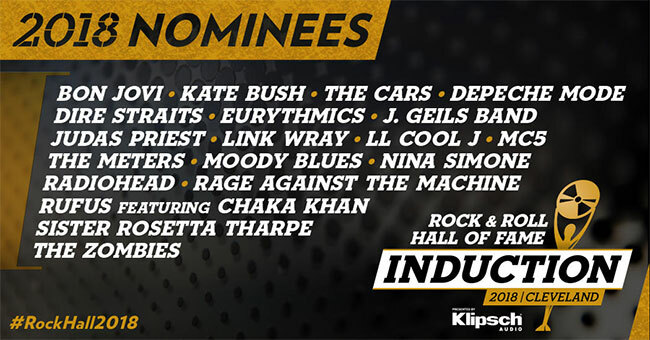 Bon Jovi, Kate Bush, The Cars, Depeche Mode, Dire Straits, Eurythmics, J. Geils Band, Judas Priest, LL Cool J, MC5, The Meters, Moody Blues, Radiohead, Rage Against the Machine, Rufus featuring Chaka Khan, Nina Simone, Sister Rosetta Tharpe, Link Wray and The Zombies are nominees for the Rock & Roll Hall of Fame in 2018. The Rock & Roll Hall of Fame will again offer fans the opportunity to officially participate in the induction selection process. Beginning October 5th and continuing through 11:59 p.m. EST on December 5th, fans can visit rockhall.com/vote to cast votes for who they believe to be most deserving of induction into the Rock & Roll Hall of Fame. The top five artists, as selected by the public, will comprise a “fans’ ballot” that will be tallied along with the other ballots to choose the 2018 inductees. Fans will need to login with a Facebook account or email to vote. Voting is capped at one ballot per day.